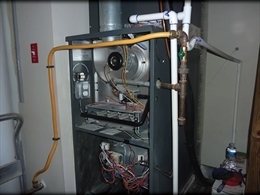 Running and repairing gas furnaces incur heavy costs. But such cost can’t be obliterated altogether. You will need them to survive the chilly days and nights of winter. But there are ways to bring them down. •	Weather stripping or caulking around the door, filling the gaps through which warm air from the furnace can sip out are some of the measures every homeowner should take. These kind leakages often reduce the pressure level inside the rooms which cause the warm exhaust air climbing up the flu to come down and diffuse in the living space. 7 to 12 percent of a home's heat loss occurs around windows and doors. Even in cases where back drafting does not happen, the leak of air reduces the comfort level of the rooms. As a result the user cranks up the thermostat for better heating. This leads to greater consumption of energy and also makes the furnace work harder. All these will make the furnace work longer and harder, which is bad for its health. If you find that the weather stripping is in bad condition, replace it ASAP. Also cover your window and patio doors with thin plastic film which also prevents air from leaking out. You can save 14 % on heating bills by doing so. Besides weather-stripping also check out the door thresholds. If you see daylight under the front door, there is a gap that needs to be done away with. The door is not in contact with the threshold through which the light is coming in. Adjust the door so that it is in contact with the threshold. This can be done by adjusting screw of the door. However do not let it rub against the found when being opened or closed. This not only interferes with smooth operation but also wears out the weather-stripping. •	The electrical boxes on the exterior walls can be very draft. Air comes inside the house through the holes in the top plates or the sill plates or from where the wiring or other mechanicals are run. The latter should be sealed with "spray in the can" foam. In such cases you can spray foam around the outside of the boxes. But never spray inside them. You can also buy some foam gaskets from home improvement store. Cut holes inside the gasket to access the switch. Now place it on the box to cover it all except the switch. Besides these the exterior walls of the house is peppered with holes. This is on account of numerous pipes that enter your house to connect with various electrical appliances. The gaps around the pipes are loosely sealed with caulk. That eventually cracks, peels, and falls off. These gaps let in outside air. Seal the gaps with expanding foam. In case of water pipes, unscrew, and pull back the escutcheon ring, then caulk around the pipe. These holes play key role in leaking warm air produced by the furnace. They are best avoided to ensure longevity of the furnace. •	Keep a space heater to heat individual rooms. You can then turn down the furnace temperature, if you do not need to heat the entire house. You can save 3 percent on your heating costs for every degree turned down below 70 degree F.
•	The chimney is also an outlet from where warm air leaks out. To prevent this you can use chimney balloon. They can save you up to $100 a year. Ensure you attics are well insulated. The attic door is often prone to leaking air outside the house. To ensure that the door blocks airflow, use adhesive to attach fiberglass batt insulation to the attic side of the door. And if the door won't lie flat, use a latch bolt system to close it tight. The duct work should also be checked and maintained from time to time to clean it off the dust and debris and maintain the insulated layer and clog leakage. •	Get your furnace maintained once in year by professional service. They will detect Gas, Carbon Monoxide or other greenhouse gas leakage from the furnace, if any and stop it through proper repairs. They will clean various parts of the furnace of soot, dust and debris. They will inspect the parts of the furnace to ensure that they are functioning as expected. This service will expand the life of the furnace, spare frequent repairs, and prevent premature breakdown. 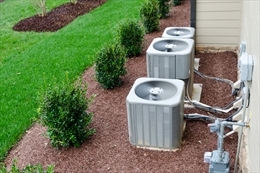 Some furnace warranties actually require this annual or regular maintenance to remain valid.